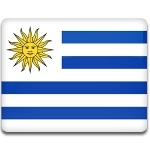 Independence Day of Uruguay is celebrated on August 25. This national holiday commemorates the declaration of Uruguay's independence from the Empire of Brazil in 1825. The region of modern-day Uruguay was discovered by the Portuguese in 1512. Four years later, the Spanish arrived in the region. Uruguay became a zone of contention between the two colonial empires. In 1777, the territories east of the Uruguay River (Banda Oriental) became part of the Spanish Viceroyalty of Rio de la Plata. The struggle for Uruguay's independence began in 1811, when José Gervasio Artigas launched a successful rebellion against the Spanish authorities. However, several years later the Banda Oriental was annexed by the Portuguese Brazil. In 1822, the Brazilian Empire achieved independence from Portugal. Three years later, a group of Uruguayan revolutionaries led by Juan Antonio Lavalleja (Thirty-Three Orientals) arrived in Montevideo. On August 25, 1825, they declared the independence of Uruguay from Brazil. Uruguay's Independence Day is a public non-working holiday celebrated nationwide. The celebration typically starts in the afternoon and can last until early morning. Independence Day festivities include public speeches, parades, performances, parties and other events. The most colorful celebration is held in the capital city of Montevideo.